Instagram is feeling the Halloween spirit! To celebrate, they’ve added a new spooky Stories filter and emojis just in time for all your costume parties and scary-movie-binge-watching plans this weekend. The first feature is a Haunted Halloween filter for Instagram Stories. To activate it, you are prompted to open your mouth, but do so at your own risk, because it’s pretty ghostly! The best part is that the front and rear-facing cameras get slightly different versions. The front-facing camera makes you look like a dark, grainy vampire with just a hint of blood splatter as if you came from Sunday brunch with your undead friends. The rear-facing camera lets you make any scene your own horror movie, and you can even add some eery music from Instagram’s soundtracks feature to be well on your way to making your own, updated version of the Blair Witch Project. The second feature will make your festive commenting on all your friend’s great Halloween costumes that much easier. 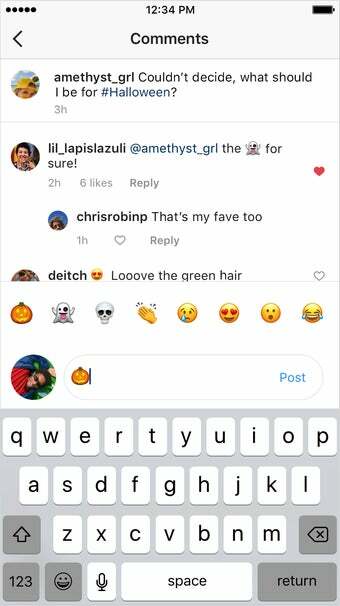 For Instagram users in the U.S. and Canada, three new emojis – a pumpkin, a ghost, and a skull – will be added to the emoji shortcut bar alongside your most frequently used emojis above the comment field. (Now, the only Halloween emoji you’ll have to go looking for is the zombie.) Perhaps Instagram will start doing this with all of our favorite holiday emojis. Being festive just got a whole lot faster. We’re loving the fun, seasonal additions. It keeps our stories fresh and just the right amount of scary. Now, you won’t have to go searching for ghosts unless you have plans to go to a haunted house this weekend.